This version of Xamarin.iOS requires the iOS 9.3 SDK (shipped with Xcode 7.3) when the managed linker is disabled. Either upgrade Xcode, or enable the managed linker. It appears you have not updated Xcode. Check on your Mac, its update may be waiting. Also I think iOS 9.3 also need El Capitan version of OS on your Mac. Option now is called "Link SDK assemblies only". Build complained and said I should enable "Managed Linker", but that option is not described anywhere. Thanks a lot, looks like iOS development with Yosemite is not possible without your hint. Anyone know how to enable the managed linker in Visual Studio? Got the same error, but even after changing the Linker option to -> Link SDK Assemblies I am getting error. Screenshot of the error message attached. Please help in resolving the error. Thanks Renuga Mohan its working . 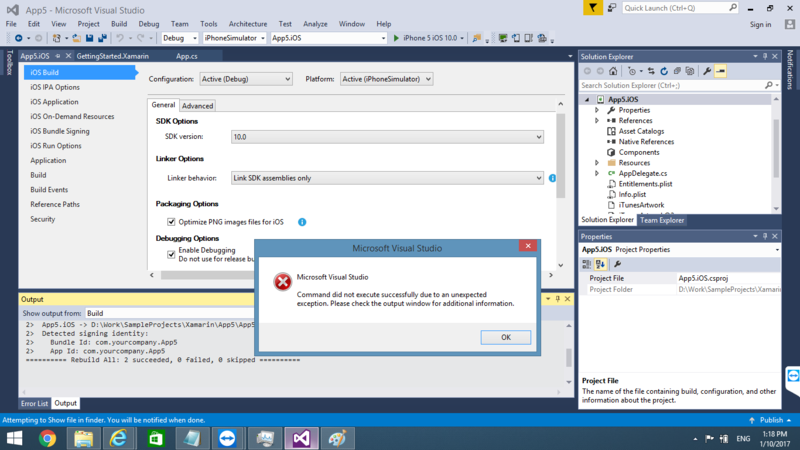 I don't understand after updating xamarin all the time 100 errors show !! Correct ... That really works if you still have the problem after updating to iOS 11.1 with Xcode 9. Thank you so much RenugaMohan! it`s very useful! it gives me another error "Unexpected error"
I get this error Failed to resolve "Android.App.Activity" reference from "Mono.Android, Version=0.0.0.0, Culture=neutral, PublicKeyToken=84e04ff9cfb79065" when I Build after I set to Link Framework SDKs only. @judsonabraham I am having the same issue. How did you resolve this? @jaspervanm I didn't have any option I had to upgrade the xcode8 to xcode 9. @judsonabraham I made a stupid mistake. Referenced a Android dll in the iOS project..
@jaspervanm I know that was showing the error but I needed the Android dll for my IOS project. Where I can get Xamarin.IOS 10.3 SDK?